Here's a restaurant some have compared favorably to Vien Dong, a restaurant many in town seem to love. We just kinda liked the spot, though apparently liked it enough to make the trek to the Valley for a meal at Three Sisters. And Three Sisters... Well, it's good. Good, but not spectacular, and I'm not foreseeing us heading there again anytime soon. It's worth checking out if you find yourself in the Valley, craving some Vietnamese and/or Chinese cooking, but probably not something to plan an outing for. I like a good bun -- rice vermicelli -- and sampled a bowl with beef and chili peppers. Credit where credit is due, the three star dish was fairly spicy and had a decent flavor of what we believe was rose water. That's all well and good, but is there anything to really put this bun above the many other average-to-good equivalents around town? Not really. There's nothing wrong with Three Sisters's bun, yet there's nothing to make it distinguishable from the same ol'. The same can be said about their beef and broccoli dish. There was beef. There was broccoli. There was a sauce. The dish was perfectly fine, but memorable? Not so much. In that sense, Three Sisters is worth a visit or two if you live close by. They serve perfectly good food at perfectly reasonable prices. Is it worth the drive from elsewhere in town? Not really. Consider it the Vien Dong of the east side. That, in itself, is not a bad thing. 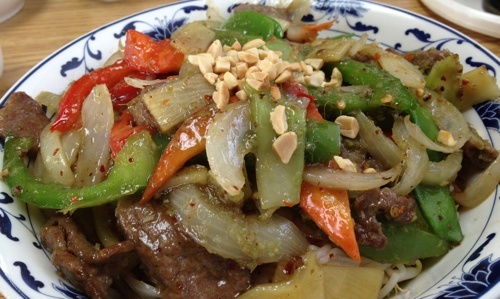 Do you recommend Three Sisters Vietnamese & Chinese Cuisine? Make your voice heard!